Although they resemble vehicle license plates, these historically colorful permits are issued to show compliance with a statute that governs the use of non-D.C.-registered oversize vehicles within the District, not the registration of a motor vehicle. When they were first issued is unknown, although an article published in the April 1987 edition of the ALPCA Newsletter indicates that they were introduced in 1971. That this is also the year in which the annual special hauling permit fee was last changed suggests that permits in the form pictured below may have been introduced at that time. 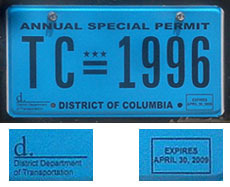 < Annual Special Permits are always displayed on the front of non-D.C.-registered commercial vehicles in conjunction with a license plate of the state in which the vehicle is registered (unless the state does not require a front plate, of course). 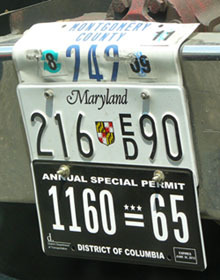 Shown here on a Maryland-based refuse truck, a 2011 Hauling Permit is used not only with a standard Maryland plate but also with a permit issued by a Montgomery County agency. 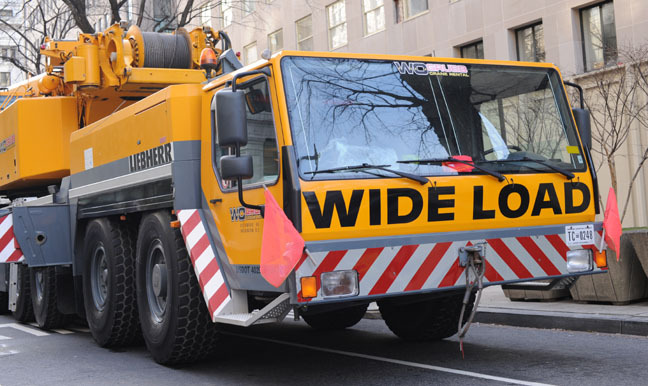 This enormous vehicle, which likely is registered in Virginia, had a 2012-13 D.C. Truck Crane permit affixed to its front bumper when it was photographed parked near K Street, NW. Because Annual Special Hauling Permits are not used for registration purposes they have never been the only plate displayed on a vehicle. Rather, they are supplemental permits displayed to show that the owner of an over-wide and/or overweight vehicle registered in one of the states (most often Maryland or Virginia) has paid a permit fee and that the vehicle has been approved for use in the District. Annual special permits have always issued been singly and are displayed on the front of the vehicle. Whereas these metal permits are issued for regular users, paper permits are issued for occasional and one-time users. 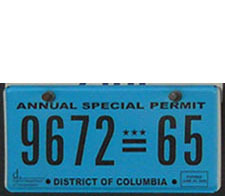 An annual special permit must be displayed on trucks with a gross vehicle weight in excess of 65,000 pounds being operated in the District of Columbia that is not registered here. The 65 prefix or suffix on most permits of this type is a reference to the 65,000 lbs. GVW threshhold, and these are most often seen on construction vehicles such as dump trucks and concrete trucks. For example, 1986 permit number 65-0062 pictured was used on a 1973 Mack three-axle dump truck that was registered in Maryland, and the fee paid for it was $917. 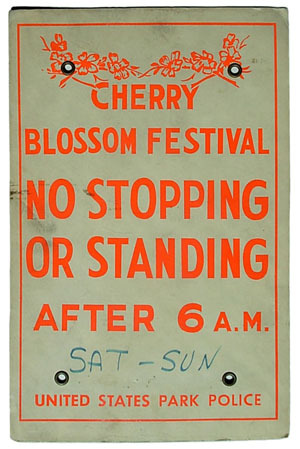 This annual fee, introduced in mid-1970, remains unchanged today. 65-Series plates expire annually at the end of June, and based upon the four-digit serial numbers of the plates shown it appears that no more than six hundred 65-series permits were likely issued annually, at least through the early 1990s. Also seen on occasion are Truck Crane (TC series) and Tractor Trailer (TT series) Annual Special Hauling Permits. About the plates themselves we know little more than what we can conclude from observing known examples. 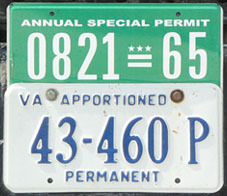 Earlier plates are unreflective and were emboosed with dies used to produce D.C. license plates issued from 1965 through the late 1990s, suggesting that they were issued sometime after 1965. More recent permits are flat and covered with reflective sheeting. All are 6"x12" and aluminum. Although as of the mid-1980s these permits were issued by the Building and Land Administration of the D.C. Dept. of Consumer and Regulatory Affairs, today their distribution is handled by the D.C. Dept. of Transportation ("D-DOT"). Nothing is known about 1995 through 2006 Annual Special Permits, although the white-on-blue permit no. TC-0141 pictured above likely represents one of the later years in this period. 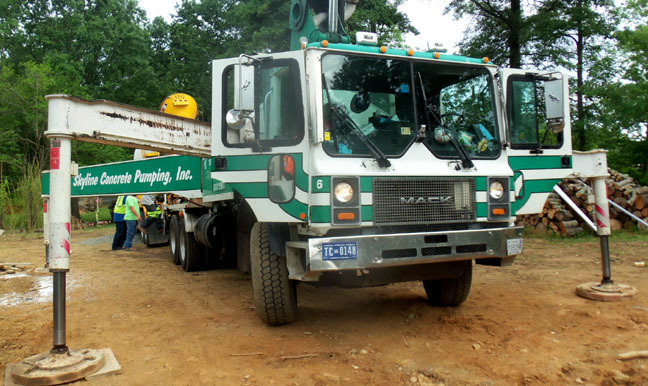 This concrete pump truck, based in Manassas, Va., was on a job site in Fauquier County when photographed in June 2015. Based upon its TC-series Annual Special Permit it is apparent that for D.C. permitting purposes this type of vehicle is considered a truck crane. 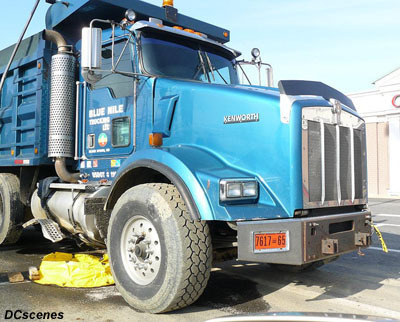 A 2007 Annual Special Hauling Permit is displayed on this Maryland-based dump truck that has been involved in a collision that ruptured its right fuel tank. 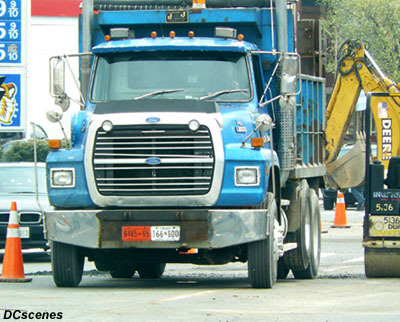 Construction sites within Washington are the most likely places to spot Annual Special Hauling Permits. Vehicles with these permits always are registered in one of the states, usually Maryland or Virginia.